There have been plenty of natural slides around Tignes and Val D’Isere this week. The dump is a good thing but people should exercise a huge amount of caution after the storm abates. when this amount of snow falls on bare ground (which is still the case in lower resorts), it's not good is it? No solid base to stick to. I am not convinced it works like that. So, no, it's not a problem. Will be a lot of deaths in the Alps in the next 1-3 weeks. It must be Spanish week round about now, they make good avalanche poodles. @Oleski, you're partly correct in that new snow won't stick as well to ground which is snowless and warm / not frozen, compared to ground which is already snow covered or frozen. However as others have said, there has to be a first big dump at some point, and the fact that it's happening early in December is better than it happening later on. Also the forecast temperatures are low and the amount of snow forecast (in the northern Alps) is quite a lot, both of which will help with it "sticking". All in all it could be a lot worse! Or, are you saying it's bad news from an avalanche / snow stability point of view? Over the weekend this looks like being accompanied by strong winds. This will raise the avalanche risk considerably in some areas. In places like the Arlberg where you could see storm strength winds and consecutive days of 50cm plus snowfall at altitude expect significant lift closures. @südtirolistdeutsch, the Arlberg looks like it will be hit hardest by the storm. During the storm itself much of the lift infrastructure is likely I suspect to be closed. From mid week the weather conditions look like improving considerably, although with that amount of snow it may take a little while to recover and off piste avalanche risk will remain high for a while (of course the combination of sunshine and high avalanche risk will produce a separate set of risks). As a rough rule of thumb 30cm plus in a day will substantially increase avalanche risks, 50cm plus will lead to lift closures, 70cm plus can create substantial risk to transport infrastructure. Other areas of western Tirol and Vorarlberg look like having similar problems though not to the extent of the Arlberg. Livigno much less as it is in a differnt part of the Alps. Keep an eye of local avalanche warnings. Does anyone know how good/quick is Lech at "preparing" the pistes after a snow storm? We only do on-piste skiing and hoping to go next weekend (15th). Thank you. When I was in Lech in mid-Dec 2012 it puked down for about 36 hours non-stop. It piled up during the day, but they were bashing it very efficiently every night. I can remember waking up one morning and seeing the piste basher on the nursery slope next to the hotel trying to flatten it all out for the arriving ski schools and the snow was so deep it was coming up like a bow wave over the cat-tracks. They bashed it all down pretty quickly, some higher slopes may have shut due to avalanche risk for a day or two, but I don't remember it impeding us much. The weekend after should be fine unless there's another storm in the offing. You'll really enjoy Lech, even better after this forecast snowfall, it will be winter wonderland! Currently massive wet soggy snowflakes the size of 2 pence coins falling - if they were not so wet and soggy / air temps colder they would be those beautiful feathers. @luigi, thank you! It's comforting to hear they are efficient at preparing the pistes! Fingers crossed! Haven't booked yet and have been obsessively checking snow forecast for the past few weeks! Am desperate to book as never left it so late before!! Look forward to skiing in Lech, sounds wonderful! So is the general consensus that the weekend of the 15th is going to be “good” in many areas? Shortlist of Solden/Ischgl/Arlberg. No off piste stuff needed for us. Is it still “too early” to book based on the experience of the SH experts? Do any of those options throw up red flags? We usually book our mid season trips about 48 weeks out so this is a new (and nerve wracking) experience for us! No-one early season skiing from Dec 16th should worry about snow. Mrs Tr is a proven & globally effective snowbringer. It is rare that we arrive in the alps anywhere near our scheduled time. Snowmageddon I & II were down to her, as was the UK snow "event" in Dec 2010 when we struggled to get home from a snow-bound London Heathrow after a cheeky early-season weekend on skis. She was responsible for the devastating snow storms that buried California in 2006(? ), and again in late 2017 - the only two times we have been there. I am pretty sure was involved in the Beast from the East here last year also. Never mind the maps and models. All anyone needs to know is that we are arriving in Innsbruck - en route to Selva Val Gardena - on Dec 17th. Conditions for travel will be horrendous; conditions for skiing (if you make it to your resort) will be extraordinary. Dont suppose Mrs Tr fancies a detour via Alpe D huez ? For MrsTr, fresh snow is like fresh paint for our Queen. It is ubiquitous and all enveloping, an ever-present constant throughout her skiing life. She has no concept of icy conditions, rocks on the piste (never mind grassy patches) or rain->snow events. Only rarely has she skied on what she calls "old snow" that has been tampered with by piste bashing machines, or been required to use her edges. For her, skiing is a graceful and smooth experience, conducted only with the soft sibilant hiss of cold white powder underfoot. She does not understand how people injure themselves skiing; "How can that happen, it's like falling on a soft cushion?" Or that some people are unable to ski from first to last lift every day of their holiday because of something they call "conditions". She is a truly magnificent skiing partner. Turkey, around Uludag, set to get 1-2ft of snow over the next few days and kickstart their season. I much prefer inefficient piste bashers myself. I like it when they sleep in after a 50cm plus storm, and get up late, and maybe bash one small strip of piste. I recall being up in Whistler Blackcomb about 10 years ago after a 50cm+ dump of snow. The electronic grooming sign simply said this at the mid-mountain station - "Today's groomed runs...are you kidding? We just received 50cm of snow! Enjoy it!" Needless to say, they didn't groom anything from mid-station on up. It was awesome! Glad to hear the Alps are going to get hammered. The front end pain will be worth the back end gain! Meanwhile here in the USA, the San Juan mtns in SW Colorado should see snow today into Friday. This will include southern Utah and New Mexico along with Northern Arizona. Then the GFS which has been consistent the past several days on storms hitting the PNW, are still showing strong signals for storms to arrive in successive waves, each one with a bit more energy than the last. The main flow is coming out of the NW, i.e. the Gulf of Alaska, which means colder than normal air. These storms are set to hit the BC Coastal Range and the Cascades late Saturday and continue into Wed/Thursday of next week. Mt. Baker, which is a snow magnet for these kind of storms could get over 1 meter in the alpine. The Southern Cascade range all the way down into Central Oregon might see about 50cm or so. Places like Stevens Pass and Mission Ridge in Washington tend to do well with these systems coming out of the NW as well. Whistler should also make out nicely, and then the energy will tend to dissipate as it moves inland. So interior BC, Idaho, Montana and Wyoming should still see some accumulation but too soon to have a good sense for how much. 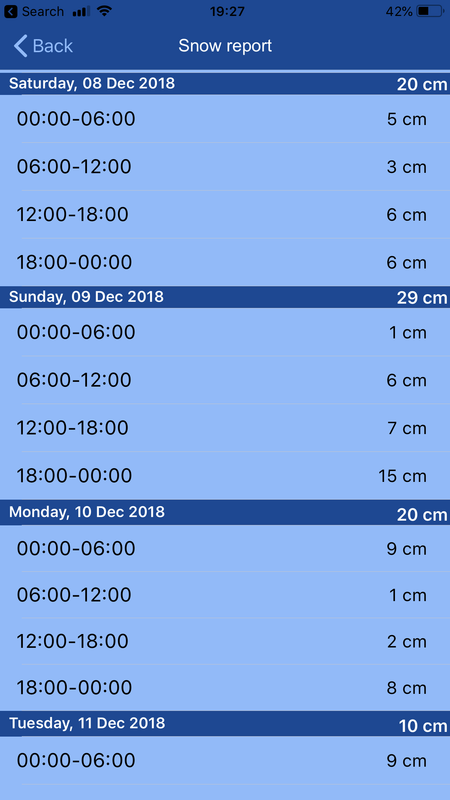 Right now it's looking like 4cm-5cm each day from Sunday into Wednesday, possibly Thursday. Farther out, there appears to be additional low pressure activity working it's way toward the Western States, and long range models indicating continued storminess into the weekend of Dec.15th and into the week of Dec. 17th. Colorado continues to out perform. So any Euros headed that way will be very pleased with conditions in the Colorado Rockies! @IanTr, could we please start a new thread dedicated to your future ski trips with Mrs Tr? Phew. Thanks for that reassurance. Interesting to see the Premiere Neige women's downhill race cancelled this week in Val d'Isere, due to lack of snow at low altitude. Val d'Isere used to pride itself on the "first snow". But the race, nowadays, gets called off just about every other year. How many degrees do you guestimate that slope is? Was surprised to see the dogs being able to run down it. My latest long term forecast for Europe. Doesn't look bad at all from Christmas for the Alps, in the North in particular. @Jellybeans1000, that was your best one yet.....highly complex, but with some nice explanations. Am only just getting to understand some of the jargon and interplays...btw, what is FT? One other question is on that +AAM global anomaly chart, with all that low pressure in the atlantic, would the alps not be at risk of SW ly's? Bascially what direction would the jet stream take? This season so far continues to see high pressure forming north of UK into scandi, but with the atlantic so strong at this time of year, the blocks aren't lasting long. Then again, we've seen the model bias where the deep low's to the west don't make as much progress as the computers predict (underestimating the block). Next week another battle lined up as the lows try to undercut again into europe. @Mr.Egg, might be a bit bleak on the glacier. I'm heading to Lech on the 15th for a week, can't wait to see the place turn white on the webcams, it's looked pretty hopeless for the poor folk skiing there this week. @Snowy123, wouldn't worry too much about booking late. For the same pre-Christmas week last year the snow conditions on piste were perfect and most of the week we were the only people staying in our hotel. @Valkyrie, just desperate to book so that I can have something to look forward to! Fingers crossed I might see you on the quiet slopes of Lech! Btw, are you flying into Innsbruck? If so, which taxi company are you using for transfer? And any mountain restaurant recommendations? Thanks! Other half comes out in a rash if i mention her trying a red run. Most Slopes are open & lifts are open. As a consequence of storm-strength westerly winds, an active cold front is expected to cross over the northern flank of the Alps on Friday evening. On Saturday as well, skies will be heavily overcast, accompanied by precipitation. The snowfall level will swiftly descend from 1600 m down to approximately 1000 m. In the furthermost southern regions it is expected to be quite sunny as a result of strong to storm-strength northwesterly winds. - remaining regions of Switzerland: 10 to 25 cm over widespread areas; less on the southern flank of the Alps, in the southern part of Central Grisons, in the Upper Engadine and in the southern part of the Lower Engadine. At midday at 2000 m, -5 °C. Winds will be blowing at strong to storm velocity from the west, on the southern flank of the Alps from the northwest. As a consequence of the storm-strength westerly-to-northwesterly winds, precipitation is anticipated over widespread areas. In the Valais, on the northern flank of the Alps and in northern Grisons, the precipitation is expected to be very heavy, particularly on Sunday and throughout Sunday night. The snowfall level is expected to temporarily ascend to approximately 1600 to 1800 m in the northern regions on Sunday morning. Subsequently the snowfall level will descend down to low lying areas. Avalanche danger is expected to increase significantly. Presumably on Sunday in the furthermost western parts of the Valais and at higher altitudes of the northern Alpine Ridge, avalanche danger level 4 (high) will be reached. Subsequently, this danger level (4) can also spread to other regions along the northern flank of the Alps, in the Valais and in northern Grisons. In the course of this dynamic process, even very large-sized avalanches can be expected. Snow down to 1200-1500m in the French Alps this evening. Rain in Chamonix town at 1000-1200m. If you're thinking this weekend, winds might be a killer. Schlick will open though, so there'll be something to ski. IMO, this coming weekend, with snow, wind, and yo-yo-ing freezing levels, Ischgl will be the place to be (in Tirol). This is a sensational looking chart for those skiing at Xmas! But only if it’s not accompanied by strong wind like today. A lot of the higher resorts are largely closed this morning and tomorrow looks even windier. Should be good news though for later in the season when the weather settles down. Not sure those coming in 2 weeks are worried about wind this weekend? The posted forecast of consistent snow and lower than average temps point to great Xmas week snow conditions - continuing on from last year. The 4 years prior to that were poor at Xmas and holiday makers and businesses struggled. Will you permit me a bit of optimism?